My daughter is a thief. As grateful as I was for the newfound hope that Kennadi's clothes might magically find their way from the floor to the safe and hidden confines of her "new" dresser drawers, I couldn't handle that the mint dresser didn't "belong." I wasn't about to re-stake claim on the mint dresser because it represented the hope of a neat and tidy teenager. I couldn't expect Kennadi to abandon her Beatle-mania to accommodate the mint dresser. I also wasn't going to put another penny into re-decorating a room I had decorated more recently than any other room in the house! 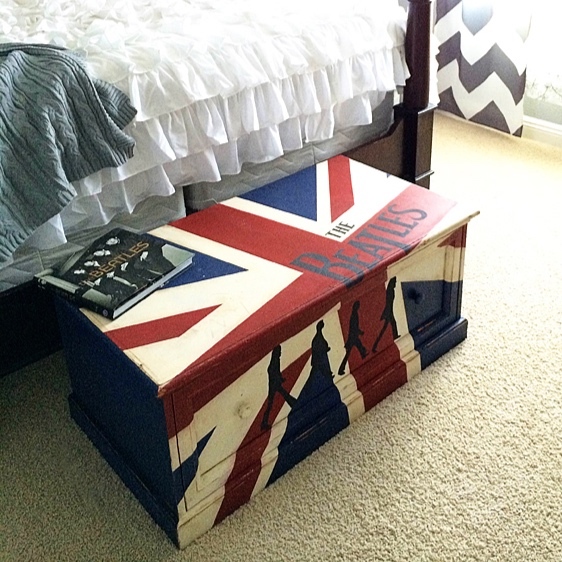 Determined to marry the dresser with the Beatles room, I wandered around the house in search of a solution. "I can solve your dilemma! Make ME over!" Does anyone else have furniture and home decor yell at them? It's surprisingly common in our home. I budged slightly on my unwillingness to spend another penny and bought two sample jars of flat finish paint from Home Depot--one in white and one in black. I mixed both into chalk paint using BB Frösch Chalk Paint Powder. Click here for a quick tutorial on mixing your own chalk paint. You can PAINT METAL with chalk paint! You don't have to spend an arm and a leg to do it! So many small projects beg me to transform them with chalk paint, and at $30-$40/quart, I couldn't afford to do it with the expensive boutique brands--not to mention most of my projects need less than a cup of paint, not a whole quart. With my two newly-purchased sample jars of Behr paint from Home Depot and BB Frösch Chalk Paint Powder, I was about $11 total for this makeover. Once you've mixed your chalk paint, hole yourself up for a few hours, like I did, and go make some magic happen! The glass and clock face were held in place by the same kind of thingamajigs used to hold glass pictures into photo frames, so this part was easy. Chalk paint has incredible coverage. This took just two coats of paint. 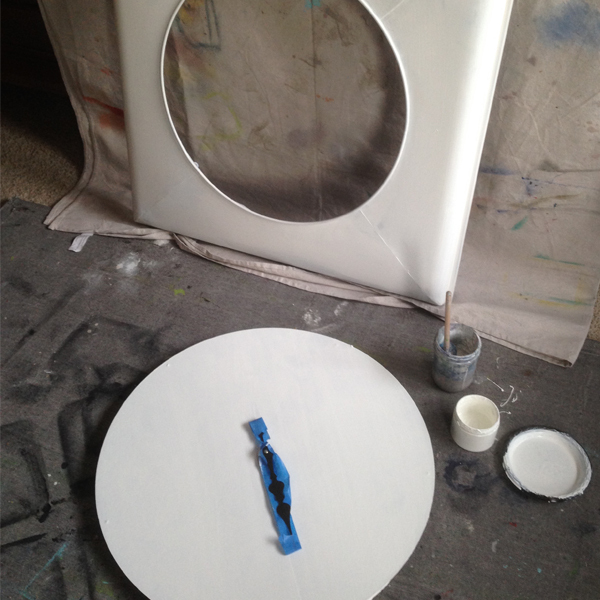 I love that, with chalk paint, regardless of the surface you are painting (in this case a metal frame and a cardboard clock face), the painted outcome is uniform and consistent. 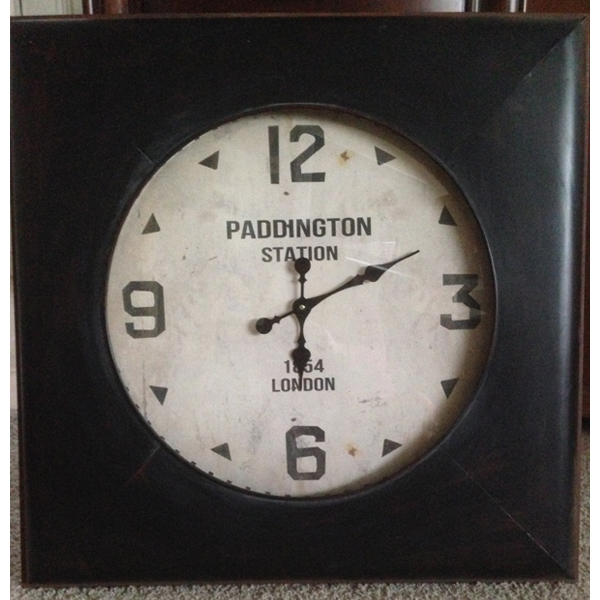 It is important to lay your frame and clock face side-by-side so your stripes line up. You will tape over the areas you want to remain the base color. In my case, I wanted small white stripes. The small strip you see between each piece of blue tape will remain white as well as whatever is under the tape. 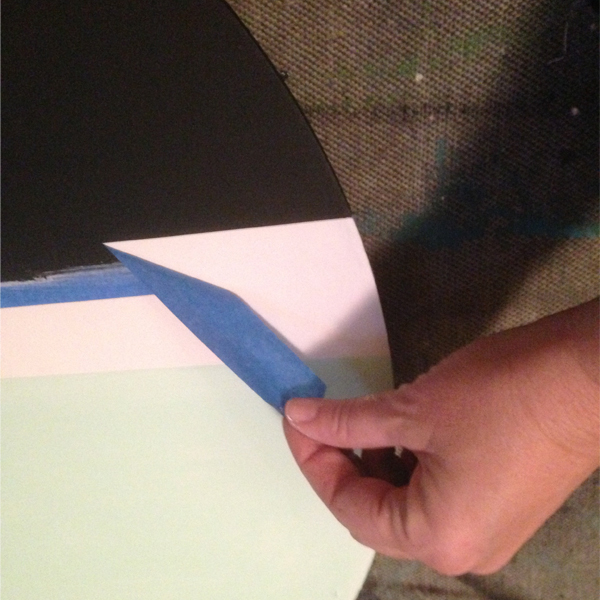 By painting the edges of the tape with the same base color (in this case, white), you create a barrier so the the next color can’t sneak under the tape. Avoiding the thin strip between the lines of blue tape because I wanted that area to remain white, I painted the thick strips--three black, and one mint. If you look closely, you can see where I painted the edges of the blue tape first with the white I'd used for base coat before painting with black and mint. 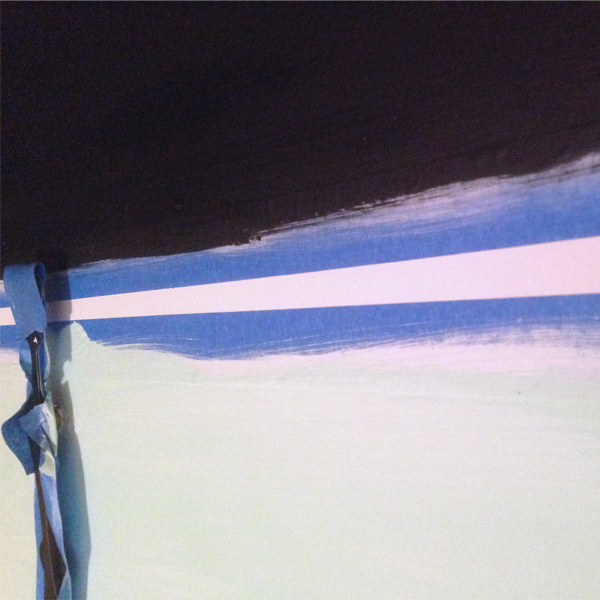 Before paint is fully dry, gently pull tape away from the stripe you just painted. Check out that crisp, clean line! 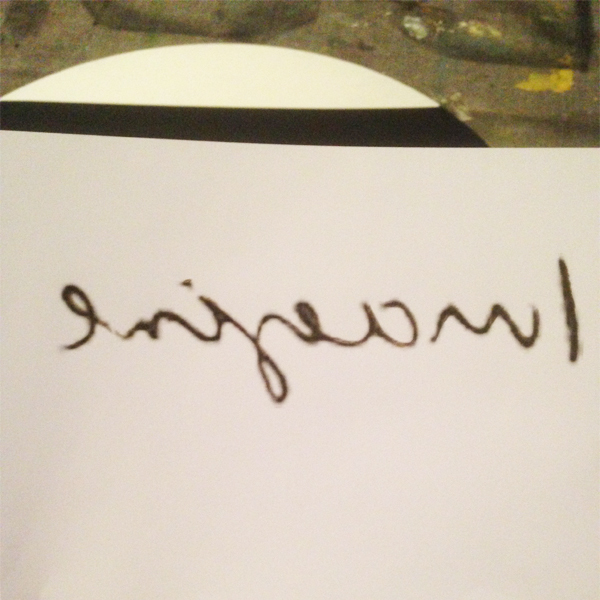 I came across a picture of John Lennon's actual handwritten words to the song "Imagine." I just printed the word "Imagine" in reverse with my standard inkjet printer. The printer ink alone is usually enough to transfer to whatever I’m painting. It’s WAY less messy than graphite paper. Place your image, printer-ink-side-down, onto your surface and, with a popsicle stick or dull pencil, rub the backside of the image. This will transfer enough of the printer ink onto your surface to give you a guide so you can hand-paint over it. I used Martha Stewart’s Metallic Glaze because I wanted a little shimmer. I decided at this point to paint the clock hands to match the word. I have used nearly every finishing wax under the sun, and have yet to find anything as amazing as BB Frösch Premium Finishing Wax. It dries and cures within minutes, not days or weeks--enough said. Another little secret about this wax is you can set the jar on a wax warmer and apply it melted. Seriously folks, it goes on like butter!